Cumhuriyet columnist Kadri Gursel speaks to media members after his release from Istanbul Silivri Prison on Monday. An Istanbul court ruled to release Cumhuriyet columnist Kadri Gursel while decided to keep four others in jail at the trial of the secular opposition newspaper, unleashing a mixed sense of feelings among those who expected the release of every imprisoned suspect. Mr. Gursel has been released pending trial on Monday after 330 days in pre-trial detention. The decision, albeit seen belated, was celebrated by Turkey’s much-battered community of journalists and his family. 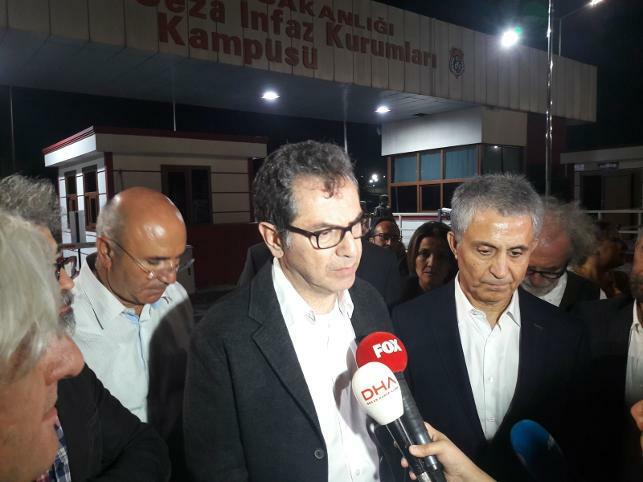 Main opposition Republican People’s Party (CHP) lawmaker Mahmut Tanal, other journalists and his wife Nazire Gursel were present when he was released from Istanbul Silivri Prison during late hours of the day. “Our friends are deprived of their freedoms. If I speak on my behalf, I was jailed because I was a journalist and Cumhuriyet writer Kadri Gursel,” he went on to say, speaking about why he was placed behind bars. He described the last hearing as “fictional,” and castigated the eyewitnesses who are called to testify against Cumhuriyet journalists. The veteran columnist also railed against some pro-government media outlets which are faster than court judges in publishing court decisions about defendants and journalists. Still, the release of a single journalist lifted spirits of the international community and gave fresh hope to the dispirited local journalists amid never-ceasing pressure against media in Turkey. “Welcome release of @KadriGursel after too many months in jail. All other #Cumhuriyet journalists should be free and charges dropped,” Harlem Desir, Organization For Security and Cooperation in Europe (OSCE) Representative on Media Freedom, tweeted after the decision. “#KadriGursel to be released, others to stay in jail in #Cumhuriyet case. We keep up the fight to #FreeMurat #FreeAhmet #FreeAkin #FreeEmre!” International Press Institute (IPI), whose Turkey chairman is Mr. Gursel, tweeted.